Dhaka, 9 May, Abnews: Three American men who had been imprisoned by North Korea are on their way to the United States, President Trump announced Wednesday after they were released to Secretary of State Mike Pompeo during his visit to Pyongyang. Trump also suggested that Pompeo saw the North Korean leader, Kim Jong Un, again and that they agreed a date and location for the first summit between a sitting American president and a North Korean leader. However, Trump did not disclose either detail. Pompeo spent Wednesday in the North Korean capital, discussing the details for the proposed summit between Kim and Trump and to trying to secure the release of the three American men, who had been detained in North Korea for more than a year. The news came as a huge relief to the families of the men. “We want to thank all of those who have worked toward and contributed to his return home,” said the family of Tony Kim, one of the detainees. “We also want to thank the President for engaging directly with North Korea. Mostly, we thank God for Tony’s safe return,” the family said in a statement. The three detainees were treated as “prisoners of war” and had not been seen since June, when a State Department official was allowed a brief visit with them while collecting Otto Warmbier, the detained college student who fell into a coma in North Korea and died shortly after his return to the United States. The longest-held prisoner was Kim Dong-chul, a 64-year-old who once lived in Fairfax, Va., and was arrested in October 2015. He had been based in the Chinese city of Yanji, near the border with North Korea, and traveled back and forth to the special economic zone of Rajin-Sonbong, where he managed a hotel business. But on his last visit, he was accused of spying for South Korea’s intelligence agencies, seeking to obtain details of the North’s military programs and trying to spread “religious” ideas — a serious crime in the North. He was sentenced in April 2016 to 10 years in prison after a sham trial. 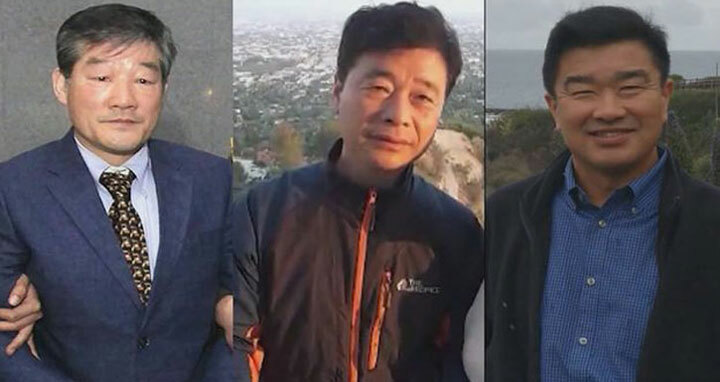 Then, a year ago, two men associated with the Pyongyang University of Science and Technology, or PUST, a private institution run by Korean American Christians, were detained. Tony Kim, a 59-year-old accountant, had made at least seven trips to Pyongyang, usually for a month at a time, to teach international finance and management to students at PUST, his son Sol Kim said in an interview. He was stopped at Pyongyang’s airport in April 2017 and arrested for “committing criminal acts of hostility aimed to overturn” North Korea. Two weeks later, Kim Hak-song, an agricultural consultant who was also living in Yanji and working at PUST, was detained. He was also arrested on suspicion of “hostile acts” against North Korea, the official Korean Central News Agency said. Kim Dong-chul and Tony Kim were both born in South Korea, while Kim Hak-song is believed to have been born in China, although he is ethnically Korean. South Korea’s presidential Blue House welcomed the release, both for the men and their families and for the signals it sends about North Korea’s sincerity. “This decision made by North Korea will be a positive factor for the success of the North Korea-United States summit,” said Blue House spokesman Yoon Young-chan. “There’s also considerable significance in the fact that all three American detainees are of Korean origin,” he said. When Pompeo touched down in Pyongyang shortly before 8 a.m. local time, he was greeted by Kim Yong Chol, a former North Korean intelligence chief, and Ri Su Yong, the influential former foreign minister. Ri is close to Kim Jong Un, having served as ambassador to Switzerland while the young leader attended school there. Both also attended the inter-Korean summit with South Korean President Moon Jae-in late last month. “For decades, we have been adversaries,” Pompeo told Kim Yong Chol, a man sanctioned by the United States for his involvement with the North’s nuclear program but who has emerged as one of the regime’s key interlocutors to the outside world. “Now we are hopeful that we can work together to resolve this conflict, take away threats to the world and make your country have all the opportunities your people so richly deserve,” Pompeo said before lunch at the Koryo Hotel, a large, double-towered building in central Pyongyang. “There are many challenges along the way. But you have been a great partner in working to make sure our two leaders will have a summit that is successful,” the new secretary of state said. Pompeo and Kim Yong Chol met behind closed doors at the Koryo Hotel for about an hour Wednesday morning, before a lunch complete with poached fish, duck and red wine on the 39th floor. Kim Yong Chol was in an effusive mood, telling Pompeo and the dozen or so staffers traveling with him that this was a good time to be in Pyongyang because it was spring and because a good atmosphere had been established between North and South. This echoed remarks that both Korean leaders have made about a new spring arriving on the peninsula. “This is not a result of sanctions that have been imposed from outside,” Kim Yong Chol told Pompeo, contradicting the administration’s line that Trump’s “maximum pressure” approach had brought North Korea to the negotiating table. “I hope the United States also will be happy with our success. I have high expectations the U.S. will play a very big role in establishing peace on the Korean Peninsula,” he said. Then he toasted Pompeo. Pompeo stood and said the American delegation was “equally committed to working with you to achieve exactly” that. The delegation’s arrival in Pyongyang was part of a sudden flurry of diplomacy in Northeast Asia related to efforts to engage North Korea. In Tokyo on Wednesday, leaders from China, Japan and South Korea met and stressed their resolve to use talks to convince North Korea to give up its nuclear weapons program. “We must lead the ongoing momentum toward complete denuclearization of the Korean Peninsula and achieve peace and stability in Northeast Asia,” Japanese Prime Minister Shinzo Abe said at a joint news conference in Tokyo after their trilateral summit.